Electrical Conduit Behaviour Alignment Use the mod manager to apply the mod. 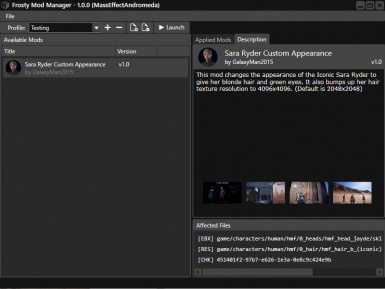 Generator Explosion Sound Fix FrostyModManager to install the mod. Obedient Squadmates Requires only Frosty Mod Manager to use the mod. Shields for Enemies FrostyModManager to install mod. Teal Baby Peebee - Armor Retexture Needed to install mod. Unyielding Ascension Requires only Frosty Mod Manager to use the mod. - Hotfix to not try and open a superbundle if it does not exist, but the toc does. 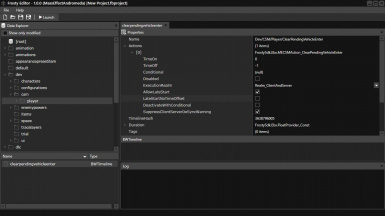 The frosty tool suite is a suite of tools for editing games that run on the Frostbite engine. 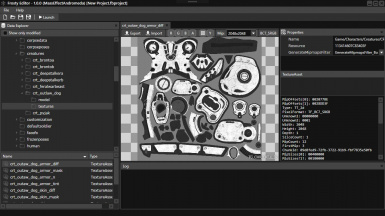 Currently the tool suite consists of an editor for creating the mods that change the game and a mod manager for launching game with said mods. Before submitting an error, please go through the Error Compendium, also located at https://munchyfly.me/frostytoolsuitetutorials/. Your issue may have already been looked into. For further support please go to the following discord server: https://discord.gg/sB8ZUAT and post in the "troubleshooting" channel. Make sure to take a look at the pinned items to see if your question has already been answered. 1. Obtain the older v1.0.2b bcrypt.dll from the optional section in the files tab. 2. 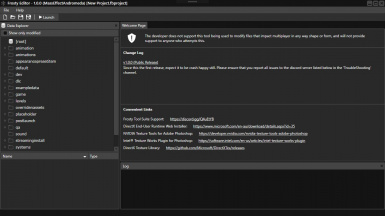 Extract the the Editor/Mod Manager install directories ThirdParty directory, replacing the one that is already in there. 3. Delete the ModData directory and bcrypt.dll from the game directory. Then try launching again.